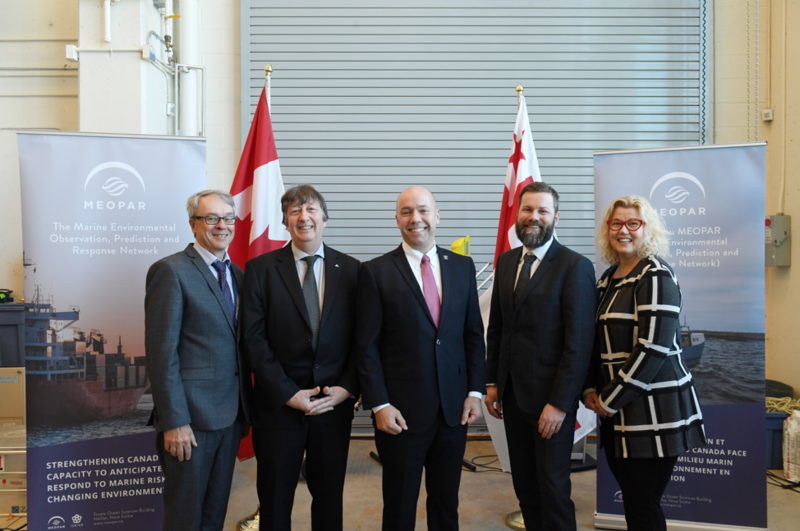 March 7, Halifax---MEOPAR was pleased to join with Fisheries and Oceans Canada recently to announce funding for the Canadian Integrated Ocean Observing System (CIOOS). Andy Fillmore, the Member of Parliament for Halifax and Parliamentary Secretary to the Minister of Canadian Heritage and Multiculturalism, made the announcement at Dalhousie's Steele Ocean Sciences Building on behalf of the Honourable Jonathan Wilkinson, Minister of Fisheries, Oceans and the Canadian Coast Guard. The Government of Canada will contribute $1.5 million per year in ongoing funding to increase the availability of ocean data and improve collaboration between ocean scientists across the country and around the world. MEOPAR is pleased to contribute $2 million in funding to the initiative, which has been a key priority over the past few years for the organization and its scientific director, Dr. Doug Wallace.